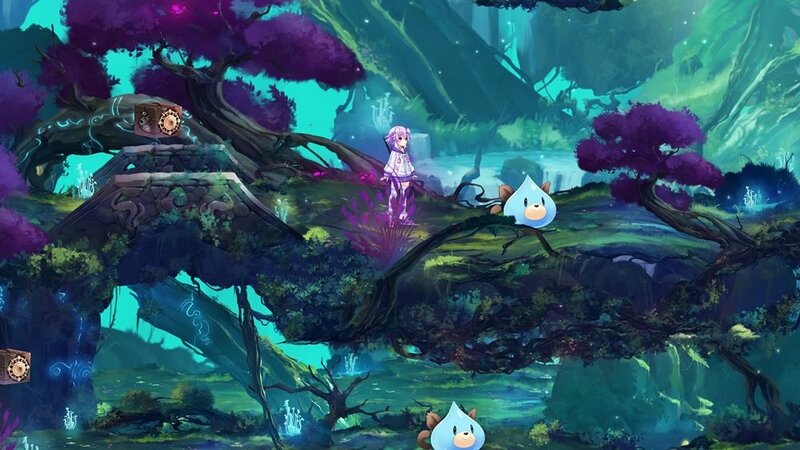 New screenshots for Brave Neptunia: O World, O Universe, Behold!! The Declaration of Ultimate RPG!! have been posted by none other than Amazon Japan. In their order page for the game, Amazon posted several in-game screenshots that will thrill excited fans waiting for the game. A self-proclaimed hero and her merry companions travel around the world. 2D games—planar games made up of pixels and illustrations. In one of many dimensions, there exists a Gamindustri built upon 2D games. In this world ruled by an organization called “Silkworm,” which worships 2D games, people create 2D games and pay taxes in game casettes. It is rumored that those who produce poor games and games that make use of new technologies are sent to the trial grounds, where their spirits are destroyed. In this Gameindustri, which damns that sort of future to hell, a girl who lost her memories awakens. The girl, who knows not left from right, headed to the neighboring town under the order of Silkworm, but monsters blocked her way. She fought back with a cypress stick that had dropped and won a splendid victory. It was then that she knew for certain. That she is a hero, the protagonist of this game named Neptune. The self-proclaimed hero Neptune will encounter various people and go on a journey with a mysterious book (Histoire). Brave Neptunia: O World, O Universe, Behold!! The Declaration of Ultimate RPG!! will be out on Japan this year, on September 27. A worldwide release date hasn’t been announced yet.